Victorian Architect Michael Smith describes the reaction by Moreland Council to an innovative affordable housing development faced with a planning policy snafu. February 25, 2015 - Last night Moreland Council presided over one of the most important planning applications it will see all year. The project in judgement was the Nightingale Apartments, a five storey proposal in a small off-street in Brunswick, Victoria. What makes this application of such importance is that it is being undertaken using the same design principles and development strategy as its neighbour across the road ‘The Commons’. The Commons, by Breathe Architecture, is of national significance (with awards to prove it) due to its principled environmental design response combined with a unique financial model which enabled the apartments to be sold at affordable prices. 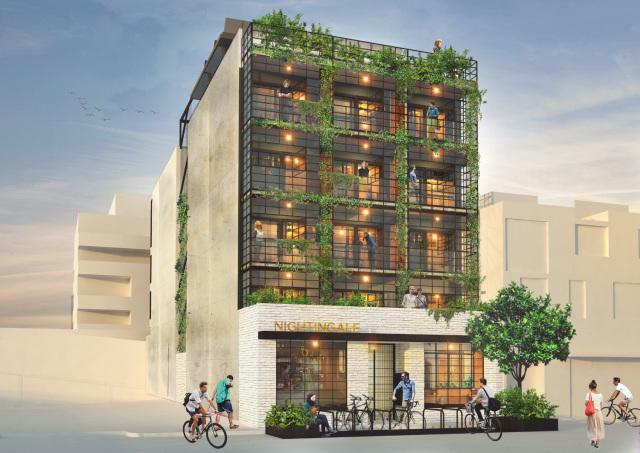 In both ‘The Commons’ and ‘Nightingale’ the developers are a band of local architects who share a belief that high quality, yet affordable medium density housing can be a reality. The Commons is proof of that reality. Through removing the typical ground level car park the project both promotes more environmentally friendly transport options and significantly reduces the cost per apartment. By providing a very high standard of sustainable features, running costs are kept to an absolute minimum. Laundries for the apartments are provided communally rather than individually, reallocating the space in the apartments to higher purposes and reducing the number of machines required. The financial model is perhaps even more innovative. The profits of the developers are capped at 15%, rather than the traditional developer model which starts at 20% and then squeezes the costs and quality to get a bonus return. In the Nightingale model, Marketing costs, real estate costs and showroom costs are all eliminated completely with savings passed on to the buyers. Typically within our planning system the number of objections to a project is a telling story. In developments of a similar scale it would not be uncommon to have 15 – 30 objections from the public submitted to council. By comparison Nightingale had just 3. It did however have an unprecedented 177 letters of support from architects and the local community wanting to see more affordable and environmentally sustainable housing. It is considered that the proposed development achieves excellent sustainability outcomes through no car parking provision, emphasis on alternative modes of transport, provision of renewable energy sources and use of passive design principles. High quality contemporary architecture has also been achieved with engaging facades, a rooftop productive garden, and ground level activities to enhance the public realm. Despite this, the ultimate conclusion of the officer’s report was a recommendation that a permit should be granted subject to significant changes to the distance of the front façade to the street front at the upper levels. The justification for this recommendation was that the Nightingale project was not compliant with a new policy which, according to the applicants, had not existed at the time the planning application was originally lodged. Further to this, the planning policy in question is still yet to be adopted as an official policy of the council. The idea that a retrospective application of a yet to be adopted planning policy could be used to substantially modify a building design at the eleventh hour is ridiculous. Yet that was exactly what was proposed by the council planning department. It was then up to the elected Councillors to decide. The Moreland Council Urban Planning Committee Meeting commenced at 6:30PM in front of a crowd so large that the furniture had to be re-arranged to allow more standing room at the back. After an introduction by CR Helen Davidson as Chair of the Committee a council planner talked through the submission. From a more practical viewpoint, the issue in question was: should the building be allowed to overshadow the footpath on the other side of the road at the equinox? The road itself is an important pedestrian link from Sydney Road to Anstey Train Station and the pedestrian experience is a valid issue to consider. With this issue lingering in the air, objectors were offered a chance to speak. With the brief silence that followed, it was unclear if there were none willing or just none present. Then it was the supporters’ turn. Rather than the customary 3 minutes per person (which could have taken all night) Jeremy Mcleod, the director of Breathe Architecture, led the discussion, first introducing the people who have already been balloted to purchase and live in the apartments. There were some extraordinary comments from the new home buyers. Next to talk was a housing affordability researcher. Describing the project as a deliberative development rather than a speculative one, she strongly urged the Councillors not to reduce the building size, as it may affect the overall viability of the project. She also made the excellent point that whilst the architect developers might accept a reduction in profit, the financiers of the project would almost certainly not. After a final discussion by Jeremy Mcleod discussing and proving the very minor nature of the street overshadowing issue it was over to the Councillors to make their remarks and to vote. Immediately CR Samantha Ratnam took the opportunity firstly to praise the project for its quality and secondly to remove the suggested design change conditions originally proposed by the planning officers. This motion was seconded by CR Lambros Tapinos who described the overshadowing concerns as “a very small price to pay for all of the benefits”. With that, the motion was passed unanimously to spontaneous cheering from the crowd. As commented by others such as Stuart Harrison, this new model has the potential to change the property development industry. Nightingale style projects offer the purchaser a better quality home at a lower price. It also comes with a community centered and environmentally sustainable lifestyle as a bonus. Massive congratulations to all of the Architects involved and in particular Breathe Architecture and Jeremy McLeod. This piece of architecture is exactly the type of project that provesArchitecture is for Everyone. Michael Smith is an Architect and Co-director of architecture firm Atelier Red + Black, based in Melbourne, Australia.